Peden Bloodstock has extensive experience of establishing and operating quarantine facilities for completion of pre-export or post-import quarantine for large groups of horses. In many cases horses must be kept under quarantine conditions whilst competing at an event. Peden Bloodstock works alongside the Organising Committees and plays a pivotal role in the design of the venue and establishment of the various necessary quarantine arrangements to ensure that the requirements of all countries of return are taken into account. 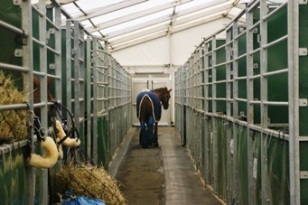 During quarantine all horses must be adequately segregated by health group both while stabled and during exercise. It is only under such conditions that they may be certified as free from infectious disease and hence meet the health requirements of their country of origin prior to returning home following the conclusion of the championship. Peden Bloodstock works with OCs to construct workable Standard Operating Procedures for the quarantine (or venue) facility to ensure that their status is uncompromised. Peden Bloodstock have significant experience establishing and operating Equine Staging Posts to facilitate logistical requirements for large equestrian events. Most commonly Equine Staging Posts are established to consolidate horses prior to flight; however they may also be used to facilitate controlled entry to Show and Competition Venues which may also accommodate security or veterinary entry measures. Peden is highly experienced in the planning and establishment of such temporary Staging Posts and will ensure that the facility fully meets the unique logistical requirements of each Equestrian Event.